The song ‘Despacito’ (meaning slowly) by Puerto Rican artist Luis Fonsi received many praises, accolades, and awards including three Grammy Award nominations. It wasn’t a surprise then that YouTube was suddenly flooded with many covers and renditions of the song. But one version that stands out is definitely the one where Manice Gandharva reproduces the tunes on his sarangi accompanied by Tunna Bell Thapa on the guitar. As a child, Manice wasn’t too excited about playing the sarangi. He was more interested in playing the drums and he started learning to play the instrument when he was around nine and played it during school functions as well. He only took to sarangi when he was 14 years old, learning from his uncle Bikram Gandharva, a sarangi player himself. “Sarangi was a traditional instrument but since no one was playing it, there was the risk of it becoming obsolete and so I thought I should take it up,” says Manice adding that since his uncle didn’t really understand musical notations he had to learn by copying what his uncle did with his hands in order to learn to play the sarangi. However, with the help of YouTube, Manice learned how to read the notes on the sarangi. “It’s one of the few instruments played with the nails. In guitar or violin one presses the strings with the skin but for sarangi it’s a different case,” he says adding that the strings of the sarangi are to be touched with the fingernails and the bow is to be gently run against the lower part of the strings. According to him, it was difficult to learn the instrument initially as his classes with his mentor weren’t regular and he had to rely on his vision to grasp the positions of the finger rather than reading music. By 2014 though Manice had learnt quite a lot to start playing the sarangi professionally. When he was playing the sarangi at Nepal Music School, Roshan Putwar, a flute player, approached him for a collaboration. He had his first gig along with Putwar’s band Garuda at Dallu chowk and he describes that as a memorable experience. “It’s hilarious how nervous I was at the time. Nowadays I’m much more prepared and focused,” he says adding that he practices every single day in order to further refine his skills. During this transition from an amateur to a professional, his parents fully supported him and still continue to do so, buying him gears needed for his gigs. In all his years as a professional sarangi player, Manice has traveled to several countries in Europe like Switzerland, Germany, Austria, the United Kingdom, France and others. He traveled with fellow traditional instrument players for concerts. “It has been a great experience so far. I had no idea playing a folk instrument would get me this far,” he says. Today, Manice is also a part of the instrumental band ‘Skin and Bones’ that reproduces popular songs to give it a traditional twist. Their version of songs like Sia’s ‘Cheap Thrills’ and Ed Sheeran’s ‘Perfect’ can be found on YouTube. 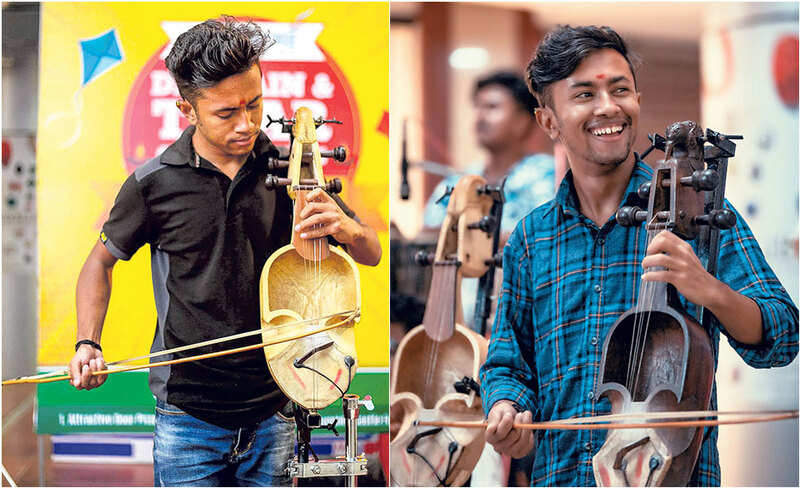 With around 94,000 followers and views in the range of millions, they are on their way to becoming one of the most popular instrumental duo in Nepal. However, Manice has also collaborated with other artists, the most recent collaboration being with a team of 15 artists together called the ‘Strings Ensemble’ out of whom 12 were sarangi players. He has also had numerous gigs in places like the Patan Museum, City Center and performed during events like Jamarko Jatra and the Boudha Rock Fest, to name a few. “It’s absolutely possible to make a career out of music,” says Manice adding that he thinks anyone interested to play traditional instruments for a living has a bright and fulfilling future. Along with playing several popular Nepali pop and folk songs, Manice also makes his own music, composing and playing his own musical pieces. “Just like words, the tune and rhythm depends on the emotion I feel while creating it,” he explains. According to him, his creative process starts with what he is feeling on the inside, his emotions modulating the liveliness or grimness of the tune he plays. But more than making music, Manice, now 23, says he is proud to have been able to play a role preserving our musical history and culture. For that, he has also taken to teaching those interested in learning to play the sarangi. He wants to keep the tradition alive and is willing to do whatever he has to for it. Manice also says he is heartened by the fact that there seems to be increasing interest of musicians in traditional songs and instruments these days. This, he believes, will go a long way in keeping the essence of sarangi and other folk instruments alive.